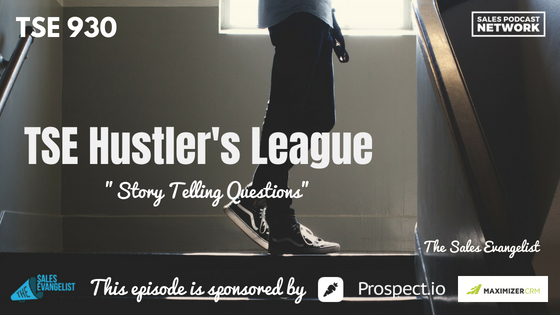 TSE 930: TSE Hustler's League-"Storytelling Questions"
It’s tempting to think that when a lead contacts us first, the transaction should be pretty simple. We’ll ask about the company; about the challenges the company is facing; we’ll try to determine how we can help. But what happens when the conversation goes nowhere? You must make sure you’re asking storytelling questions. On today’s episode of The Sales Evangelist Hustler’s League, we’ll address the questions you’re asking of your leads and discuss how storytelling questions will help him tell his story. Even when people land on your website looking for information, they may be a little shy about opening up. They may not immediately volunteer to share the problems they are facing. So what do you do? How do you qualify the lead to determine whether you can help? You have to begin by learning about the lead, and the best way to learn about your leads is through their stories. 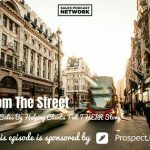 I recently had Paul Smith on the podcast, author of Sell With A Story, and he talked about capturing attention, building trust, and closing a sale. He talked about the importance of stories. We know that stories date back eons, and we’ve done countless episodes in the past about how you can improve your storytelling skills. What we haven’t addressed often is the fact that stories can help your buyer reveal important information to you. When you need to understand his business and his challenges, you can do that by having him tell you a story. Don’t be afraid of silence. Fight the urge to break the ice. Give your buyer time to process the decision. Once you have rapport and relationship with a prospect, it’s ok to give him time to consider all sides of an issue. Silence can be very powerful for both seller and buyer. Ask the question that requires story. Use open-ended questions. Unlike the question, “What is your biggest challenge,” this question prompts prospects to tell a story. When they do, they’ll include other characters, other situations, and specific instances that led to this moment. Stories reveal a lot of information. They require people to recall a time something went wrong and identify all the problems that occurred. That will help you identify true issues that will help you frame a demonstration or present a solution in a way that will help your prospect. Find out the prospect’s current role. Research on LinkedIn to discover what his position is and use that to build rapport. Again, ask a question that prompts a story. 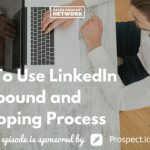 You can bring up something you saw on the prospect’s LinkedIn and initiate a conversation. Ask the prospect to tell you about something you saw on the page, and it will lead to specific conversation and stories. Consider having the prospect meet you somewhere outside of work. Go to lunch or dinner, or meet at a trade show event. Get the prospect away from the office mindset and ask him to tell you a story. In this setting, he won’t be thinking about his role in the company. He’s outside, and that allows him to share more freely. Don’t use it as a fishing expedition. Do this with customers who have already expressed interest in the product or service you’re selling. Share your own story first. Tell about a challenging situation you overcame. It may prompt him to share a similar experience he had. Seed the story. If you sell office furniture, share your own story about office furniture to encourage him to share a challenge he has struggled with. Check out Paul Smith’s book Sell With A Story for more information about using stories to sell well.